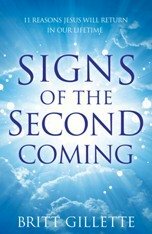 So why did our family decide to build End Times Bible Prophecy? That's a great question, and the answer could change your life if you've ever toyed with the idea of launching your own website. 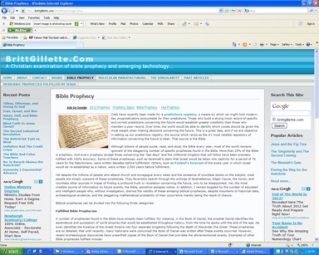 In early 2007, I created BrittGillette.com out of a personal passion for God's Word and a desire to help others understand end times bible prophecy. I already owned the domain name, so I set up a WordPress blog and started writing articles. However, little did I know this wasn't necessarily the best way to go about creating a website - at least not if I wanted optimal results. 1) A Bad Domain Name - The subject of BrittGillette.com was end times bible prophecy, not me (Britt Gillette). This was a two-fold negative: a) new visitors didn't necessarily know what the site was about, at least not at first glance, and b) a keyword-rich domain name helps generate search engine traffic, and the site didn't have a keyword-rich domain. Needless to say, BrittGillette.com received a lot of search engine traffic for the search term "Britt Gillette," but I wanted it to receive lots of search engine traffic for end times bible prophecy related terms. 2) WordPress Limitations - The WordPress template I used also harbored some disadvantages. It was not easy to modify, and while it may have been easy for a techie, I'm certainly not a website programming guru. Most of the code behind the webpages was way over my head. While WordPress is free, and it makes setting up a blog fast and easy - it also comes with a number of headaches. The particular template I used for BrittGillette.com didn't even make use of page descriptions, what I now know is an essential factor in generating high levels of search engine traffic. Needless to say, BrittGillette.com did not get much search engine traffic as a result. 3) ISP Issues / Technical Issues - In addition to all the technical constraints of the WordPress template, I also wasn't sure how it all worked. While you don't necessarily have to understand how everything in life works in order to use it, this left me with a sinking feeling nevertheless. What if the site crashed? Would I be able to rebuild it quickly? Unfortunately, I didn't know the answer to that question. In fact, on a number of occasions, I spent entire days trying to solve conflicting issues between my WordPress blog and the Internet Service Provider (ISP) hosting the site. For example, one day I woke up to find all my posts in reverse order (from oldest to newest). This caused quite a bit of confusion for visitors, and it took two very stressful days before I resolved the problem. Similar issues cropped up on multiple occasions. Needless to say, it was quite frustrating. I wanted to work on new content for the website. Instead, I spent countless hours just trying to fix things that shouldn't have been broken to begin with! 4) Poor Search Engine Optimization - I mentioned this point before, but it's really at the heart of why our family launched End Times Bible Prophecy. After all, traffic is the lifeblood of any website. Without it, what's the point in spending so much time building a website? Since launching BrittGillette.com, I've learned a lot about how to optimize web pages for search engine traffic, and due to the WordPress template I locked into, most of that new knowledge is useless. The template simply doesn't allow me to modify the meta tags, write a page description, or generate keyword-rich URLs - all helpful (if not absolutely necessary) ingredients for high search engine rankings. Couple that with a less than descriptive domain name, and it's easy to see why search engine traffic was so miniscule. So despite an abundance of links from popular sites like Rapture Ready, Rapture Alert, and Prophezine, site traffic hit a high water mark, and it could never get over the hump. It was frustrating, but a passion for the site's content and a belief in its eternal value kept our family going. After our daughter Samantha was born, Jen and I decided that at least one of us should stay home with her full-time. But for that to happen, we needed extra income. So, we started searching for various ways to replace that missing income. The result of our search? Site Build It! offered an all-inclusive package for hosting a successful online business. The more we learned about SBI, the more we liked. Due to years and years of studying websites, search engines, web marketing, and other such topics, we knew right off the bat that SBI was "the better way" our family was looking for. After a few days of research, we signed up for Site Build It! and got to work building a personal retirement planning website, Your Roth IRA. The speed and ease with which we built a website, as well as extra income for our family, was impressive. Why not apply Site Build It! and its superior techniques to BrittGillette.com? So that's exactly what we did with End Times Bible Prophecy. 3) Massive time savings since we no longer have to deal with technical issues - this of course results in more time to create new content for the site's visitors. It's a win-win situation for everyone. So why does Site Build It! work so well? Well, because it's meant to. SBI isn't a free webtool like WordPress, it's a platform for creating a thriving, high traffic website. In fact, the 10 Step Action Guide is essentially a step-by-step online business plan. But what I love most is that SBI takes the technical issues out of the equation, saving an enormous amount of time which can be devoted to new articles. As someone who works a full-time job in addition to running two high traffic websites, that's a big deal. All these built-in elements save valuable time so that I can focus on writing new articles for the site and distributing them across the web to a wider audience. Site Build It! has literally been a dream come true. I personally believe it's a blessing God gave to our family. Not only do we earn extra income from the Internet, thus allowing Jen to stay at home full-time with Samantha, but SBI gives Jen the ability to do something she's wanted to do for some time - accept prayer requests from the website's readers. On BrittGillette.com, we struggled to figure out how to launch such a feature. But SBI allowed us to build the prayer request icon you now see in the upper right hand corner of End Times Bible Prophecy. Because of SBI, Jen's long-held dream is now a reality. WordPress didn't offer a similar function, but SBI walked us through the process of setting up a form which automatically emails her whenever a reader submits a prayer request! 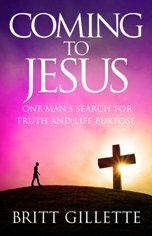 End Times Bible Prophecy is our treasure, and since its focus is Jesus Christ, it keeps the desires of our heart continually focused on Him. In a nutshell, SBI gives us the ability to pursue a personal passion for God's Word as well as make sure the message of our ministry reaches as many souls as possible. 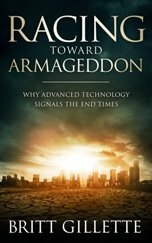 So why all this background information on how and why we built End Times Bible Prophecy? Well... you might be interested in building your own website! In fact, if you've read this far, you've probably been thinking about possible topics for the last several paragraphs. Let me encourage you to keep brainstorming, because the Internet is a powerful tool which affords you the opportunity to enrich your life in many ways. 1) Spread the Gospel - Arguably, there's no better place to spread the Gospel of Jesus Christ than the Internet. You can literally reach the entire world with the touch of a keystroke. And a webpage you create today can influence people tomorrow, a week from now, a month from now, a year from now, a decade from now, etc. Spreading the Gospel is work of eternal value, and the Internet provides you with more opportunity to do so than any other Christian generation in all of history. 2) Pursue a Passion - But perhaps an Internet ministry isn't your area of expertise. That's fine. It's not for everyone. But everyone does have a special talent and gift provided to them by God. What's yours? Do you have a passion for a certain subject? Maybe so much so that writing about it doesn't feel like work at all? If so, why not build a website about it? 3) Diversify Your Income with a Web-Based Business - Depending on the subject you choose, the potential exists to create a solid income stream. If you diversify your income, you lessen the possibility of a major event significantly altering your financial life. For instance, let's say all of your income comes from a 9-to-5 job. What if you get injured and can no longer work? If you have a thriving web-based business, you won't have to worry, because it'll be working on autopilot generating income for your family while you take time to recover. 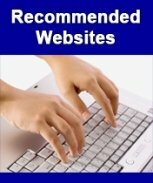 4) Supplement Your Income with a Web-Based Business - A successful web-based business affords you the opportunity to supplement your income - whether you're supplementing retirement income, adding a few extra dollars to support the family as a work-at-home mom, or maybe just generating extra cash for charitable contributions. Whatever your purpose for building a website, who couldn't use a few extra dollars? Have you come up with an idea for your website yet?